Ask yourself if the journey is really necessary or whether it might be better to postpone until the worst of the rain has passed. If you do need to go, check your windscreen wipers before you set off. Your wiper blades – both front and rear – must be in good condition. If they’re not, change them straight away. Check your tyre tread depth. If you’re driving on summer or all-season tyres, we recommend a minimum tread depth of 3mm. If you’re driving on winter tyres, we recommend 4mm. Fill up with fuel. Heavy rain often causes hold ups as cars break down or collide. The last thing you need is to be stuck in traffic with your wipers, heater and lights on but hardly any fuel. Familiarise yourself with the air conditioning and heater settings on your car so you know how to demist the interior quickly. Listen to the radio. Find out if there are any road closures, accidents or floods on your intended route and work out an alternative journey. Charge your mobile phone. You may need to pull over to let people know that you’re running late. Watch your speed and leave plenty of room – a gap of at least four seconds - between you and the car in front. Even if you’re driving with rain tyres, your stopping distances will be greater than on dry roads. If someone’s driving close on your tail, let them pass. It’s better to have them in front of you than behind. Put your headlights on but keep them on a dipped beam. Do not use your fog lights. Be conscious of spray from lorries and fast-moving vehicles. This could temporarily reduce your visibility. Equally, be considerate about your own spray and avoid driving fast through puddles close to pedestrians or cyclists. Breakdown numbers do increase in the rain as damp can cause problems with electrics and engines. If you do break down, keep your bonnet closed to prevent any further damage. Do not try to restart your engine if it has cut out after you’ve driven through deep water. 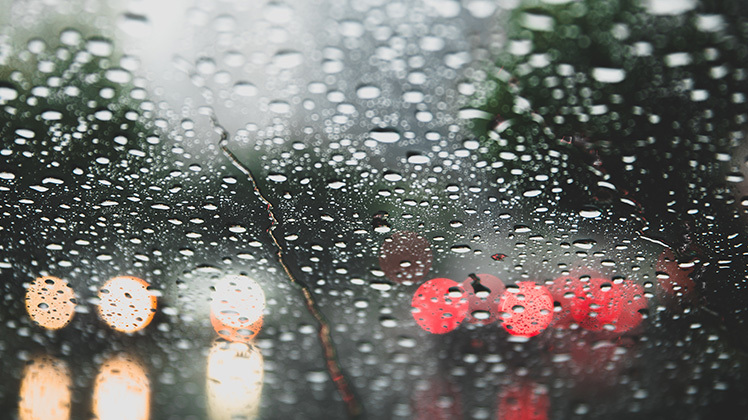 Driving through puddles can cause aquaplaning if your tyres lose contact with the road surface. If your steering suddenly feels light, take your foot off the accelerator and allow your speed to reduce until you feel in control again. Do not brake until you’ve regained control. At that point it’s a good idea to gently brush your brake pedal to create some friction and heat – and therefore evaporate off any outstanding moisture.